Manager of the Lisburn Branch of the Ulster Bank. 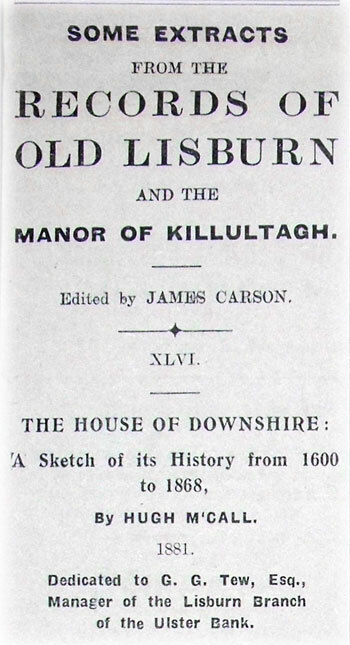 This interesting and valuable work comprises some 130 pages, and in addition to the history of the House of Downshire contains details of the founding of Tenant-right in Ulster. In 1603 Lord Deputy Montgomery paid some high compliment's to the commanders of the troops, as well as to the soldiers under them, for the heroism they had displayed in their endurance of hardships which, he added, were sometimes more difficult to fight against than the weapons of the enemy. Colonel Moyses Hill, having been knighted, was thus raised in civil rank to the same position held by his brother-commanders. For some time, however, the royal troops made little progress in the campaign, the followers of the O'Neills, the Magennisses, and the O'Hagans fighting every inch of ground with the bravery that has ever distinguished the Celt in the battlefield. But, after years of struggle, the military education of the royal army, the superior discipline and experienced power of concentrating forces, finally overcame the Irish soldiers, and left the English commanders in full possession of Antrim, Down, and a great portion of Derry. The aged Queen had then been gathered to her fathers, and James the First wielded the royal sceptre. He was greatly overjoyed at hearing of the victories in Ireland, which his ministers and himself hoped would prove a total discomfiture of the Ulster Chiefs. But the Celtish Princes were not utterly cast down; they had all the sympathies of the natives on their side, and fleeing with the remnant of their armies into the wild fastnesses of Derry and Tyrone, they found safe refuge there for the time being. Ample estates, forfeited by the Chiefs who had repudiated English rule in Ireland, were handed over to the triumphant commanders of the King's soldiers. Sir Arthur Chichester, who in Elizabeth's day boasted that he had laid waste the dwellings of native farmers and the cabins of labourers for twenty miles, on each side of Carrickfergus, was presented with an entire tract of country which had some time before been wrested from Sir Thomas Smith, and was granted him by royal patent; Sir Fulke Conway received the entire Manor of Killultagh as his reward; and Sir Moyses Hill got about forty thousand awes of land in Down, besides nearly two thousand acres of property in Antrim. Nor did the Crown gifts end with these presentations. The former-named commander was appointed Lord of the Castle of Belfast and Governor of the Fort; Sir Fulke Conway was made military chief of Ennisloughlin; and Sir Moyses Hill a few years before had been raised to the dignity of Governor of Olderfleet Castle and its fortifications. The gallant warrior resided for the greater part of his later days in an ancient building not far distant from Carrickfergus, and in 1597 married a Celtish beauty, Alice MacDonnell, of Dunluce Castle. That lady died before the end of twelve months, leaving an infant son named Peter. Some years afterwards Sir Moyses commenced the erection of a mansion and stronghold at an extreme point of his Down estate, and on a piece of rising ground situate at a picturesque spot not far distant from the hamlet of Lisnagarvagh. The work, as ultimately completed by his grandson Francis, was constructed after the design of an old baronial hall in Devon, and when finished, with its castellated turrets, high-peaked gables and loop-holed towers at each end, it was said to be one of the most picturesque castles in Down. The walls were of great strength, and the interior finish of carved oak panelling gave the character of both gloom and grandeur to the principal apartments. According to the architectural philosophy of that age, the windows were high and very narrow, as if the great object of those who designed plans for dwellings had been as much as possible to build out the light; even pure air seemed to have been placed under the ban of the architect. Around the mansion there was erected a high wall, on the top of which a number of cannons were placed. Two very powerful guns were placed in either side the archway that formed the grand entrance, causing the whole erection to appear as a powerful fortress. A broad range of tall elms surrounded the Castle, and through these there was hewn an avenue leading to the rude roadway that skirted the hillside. The structure was called Hill's Court, after the name of the mansion which, more than two hundred years before, was owned by the Right Honourable John Hill, of Devon; but the country people gave it the title of the Hall of the Hills, and hence arose the name Hill Hall, by which a large district in that part of Down is distinguished, and is still famed as being the home of sturdy men and handsome women. A portion of the well which formed the outer defence that surrounded the stronghold may yet be seen; but as there does not appear to be any care taken for the preservation of that remnant of the old Hall of the Hills, hardly a vestige of it will likely remain in a few years hence. One of the most beautifully situated, as well as one of the healthiest summer retreats, is to be found at Hillhall House, the old home of the Malcolm family. It is said the entrance hall and staircase of this rural mansion had been designed from an old painting that represented the hall of Hill's Court. The site of the house is known to have been a portion of the pleasure-grounds attached to the old stronghold, and within the recollection of some of the older farmers of the district not long passed away there had been still standing at the commencement of the present century several ancient oaks planted by Francis Hill. In very few inland districts of Ulster could there be seen so much of the beautiful in natural scenery, or such glorious sunsets, as may be looked upon from this section of the pleasure grounds of the old Castle. According to the tradition respecting Sir Moyses' second marriage, he had frequently met at a friend's house in Carrickfergus Miss Anne Dobbin. He was then on the shady side of forty; the young lady did not exceed half that age; she was very attractive, of good family, and the usual finale of the old story wound up the affair. Sir Moyses had been the hero of many battlefields, and gained much military fame, but in this second love chase he surrendered, as readily as the most juvenile courtier would have done, and in a few weeks after his first introduction to the county belle he was carried away captive even to the foot of the matrimonial altar. The young wife entered on her household duties with something like matronly wisdom. Her step-son was three years old, and to that child she proved herself a mother indeed. Twelve months after marriage she had a son of her own, who received the name of Arthur. In the very heartiness of fraternity the lads grew up from childhood, and that affectionate feeling increased as they reached riper ages, Mrs. Anne Hill having always shown to Alice MacDonnell's orphan the same motherly attention she did to her own son. Like all other Undertakers to whom lands had been granted by the Crown, Sir Moyses was bound to give his tenants good leases at reasonable rents, and also to build a castle and stronghold as places of defence, to plant the land with English settlers, and he was not to exact of them either "cuttings" or "cosheries;" that was, he should not, under certain penalties, force the tenants to entertain him and his servants on journeys, nor could he demand that his military followers, as was the case under the feudal Princes, should be free of the farmers' houses, nor should they carry off cattle except on paying the owners their value. Sir Moyses induced a number of farmers to come over from Devon and settle in Down, and to each of them, as well as to the four hundred native tenants already occupying small holdings on the estate, he granted leases at from one to two shillings an acre, and the area of every occupier might be extended by whatever breadth of land he could reclaim from the wilderness that lay near his farm. As a condition of these advantages tenants were bound to erect farm buildings and improve the land at their own cost. The gallant knight lived, as his successors have done, on the most friendly terms with his tenants. Their interest's in the soil they had improved, and in the farm buildings they had raised, he looked upon as second only to his own rights as owner in fee simple, and they had perfect liberty to dispose of each interests on the best terms they could command. In the good spirit of the feudal chiefs, Sir Moyses always celebrated holiday seasons at Hill's Court. The Yule log was burned at Christmas, the mistletoe had its special place in the Hall, and from that day until the new year set in there was open house is for all comers, with no lack of home brewed ale and ample sirloins of beef and barley bread. Easter festivals were maintained in all the spirit of the good old times, as kept up in Devon, and the Maypole was raised on the last night of April and handsomely decorated for the sports of next day. On each of these occasions the old knight joined with the people in their amusements, and for the time being all grades of rank were cast aside. Sir Moyses Hill proved himself to be the patron as well as the protector of his tenantry of all classes and creeds. The farm stock and other property of the Roman Catholics, the Dissenters, and the Episcopalians who resided on his estates in Down and Antrim were held sacred as he considered the patent by which he was chief of those lands. The rents were duly paid, and the grateful feeling which always accompanied the discharge of these obligations was highly appreciated by their landlord. After having for more than a quarter of a century enjoyed the pleasures of proprietorship the old warrior died at Hill's Court, Hill Hall, on the tenth day of February, 1630, and in the seventy-sixth year of his age. In an obituary notice of that event an ancient chronicler said:-- "Sir Moyses Hill departed this life full of years and honours, highly respected as a statesman, and very popular as a magistrate and a landowner." In course of his reign the old soldier had made several purchases of land from those native Chiefs who had either not joined in the local campaign against the English, or, having done so, laid down their arms and were pardoned. Several thousands of acres had thus been added to the original grant from the Crown, making the next heir one of the most extensive of Ulster's territorials. Peter Hill, eldest son of the deceased, had, some time before his father's death, rebuilt the old castle that had formerly been one of the strongholds of the Magennisses. Immediately after his accession to the estates he set about founding a town on the mound which formed the site of the little village, consisting of mud-wall cabins built in the old and comfortless style of rude architecture, and some of which lacked the luxury of glass windows. A number of brick houses were erected, nearly all of the two storey high, and covered on the roof with slates or shingles. Such was the origin of Hillsborough, the capital of the Downshire estates. The first heir of the property did not long enjoy his baronial honours, and at his death an only son, Francis, who till then had resided at Hill's Court, Hill Hall, removed to Hillsborough, but soon afterwards went back to his parents' mansion. It does not appear from the very few incidents which have been preserved of this gentleman's biography that he ever showed any ambition either for the greatness of the Senate or the glory of the battlefield. He had no family, and no desire for travel, the length of his journeyings rarely exceeding the run from the Castle at Hillsborough to the rural fortification at Hill Hall. Francis Hill died without male issue in March, 1655, and was buried in the family vault of the Lisburn Church, after which his uncle, the Right Honourable Arthur Hill, second son of Sir Moyses, founder of the family, became heir to the estate. This scion of the house inherited all his father's love of military life, and had joined the army when little beyond his boyhood. Having distinguished himself in the wars undertaken by Charles the First, he retired from the service with the rank of colonel. During the Protectorate he entered the English Parliament, and continued to attend his duties there until the Restoration, when he was appointed a member of the King's Privy Council. 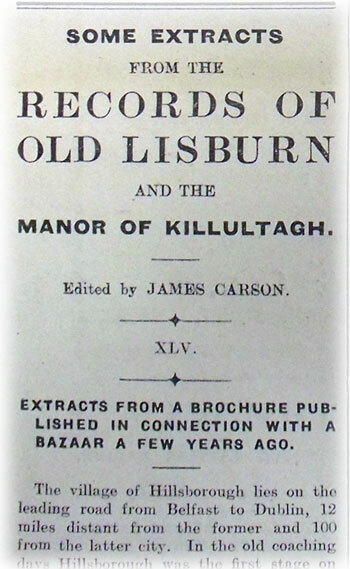 Extracts from the Records of Old Lisburn XLV. EXTRACTS PROM A BROCHURE PUBLISHED IN CONNECTION WITH A BAZAAR A FEW YEARS AGO. The village of Hillsborough, lies on the leading road from Belfast to Dublin, 12 miles distant from the former and 100 from the latter city. In the old coaching days Hillsborough was the first stage on the Dublin journey from Belfast, where the hotel afforded stabling for the horses and excellent accommodation for the traveller. The former name of the parish was Crumlin or Cromlyn -- the crooked glen -- and the present town was built in the middle of the 17th century by Colonel Arthur Hill. Some years after, by a charter of Charles II., a Corporation was established, consisting of a sovereign, 12 burgesses, and an indefinite number of freemen, assisted by a recorder, a sergeant at mace, and inferior officers. This Corporation ceased to exist in 1832, but "The Corporation Seal" is still shown in the Parish Church, and the mace is preserved in the Castle. The borough returned two members to the Irish Parliament until the Act of Union in 1800. Along with the building of the town Colonel Hill built in 1662 the first Parish Church. (A pre-Reformation chapel of ease to Drumbo parish existed, of which the ruins can still be seen in the demesne.) On its site, and still preserving parts of the walls of the nave and transepts, the first Marquis of Downshire built the present edifice in 1774. He superintended the work himself, and it was thirteen years in building. The materials and workmanship were of first-rate quality, so that today the walls and roof are in perfect order, the old oak pews remain, and the pulpit, with its quaint canopy and oak panelling is of much interest. The organ, one of the first in the North of Ireland, was supplied by John Snetzler, a well-known Belgian organ-builder of 100 years ago. It has been rebuilt on three occasions, but the old pipes and sound-boards of the Snetzler organ have been retained. There is a fine peal of eight bells, by Rudhall, of Gloucester, erected in 1773, with curious inscriptions, and in connection with them is an old carillon which plays tunes upon the bells at the hours of 12, 4, and 8. A company of bell-ringers is maintained by the Marquis of Downshire, who also provides the funds for a surpliced choir and organist. A beautiful chancel floor in Irish marble has recently been laid down by the Right Hon. Lord Arthur Hill in memory of his father, the fourth Marquis of Downshire. The vessels for the Holy Communion were presented by Mary, relict of Colonel Arthur Hill, in 1666. They are very beautiful, of solid silver, bearing the sacred monogram surmounted with a cross; beneath the letters are three nails, and the whole is encircled by rays. Other memorials worthy of note are a brass eagle lectern, also presented by Lord Arthur Hill; a beautifully-executed monument of the fifth Marquis, by Forsythe, erected by his widow; and also one to Archdeacon Leslie, by Nollekins. The Fort or Old Castle. all the way around and containing 1,500 acres. It is well wooded, beech, oak, elm, and ash growing freely, and some very fine trees are to be seen. There is a fine lake beautifully situated, and the covers abound with game. A smaller park, commonly called the demesne, surrounds the Castle, the present residence of the Marquis of Downshire. This mansion was rebuilt in 1843 by the third Marquis. The rooms are spacious, the library well stocked with books, and there is a fine collection of family portraits, from "Sir Moyses Hill" (the first of the family, who came to Ireland at the end of the 16th century) downwards. At the postern gate grows a fine old Cedar of Lebanon, which, tradition says, was planted by a Maginness centuries ago on his return from the Crusades. The whole district was owned and occupied by the Maginness clan in ancient times, and the present representative of the family, Lord Iveagh, takes his title from the name of the barony. A short distance from the town, adjoining the Dromore road, upon the summit of a hill stands, a handsome column, surmounted by a large statue of the third Marquis. It is a striking and conspicuous object for miles around, and from its base a fine view can be obtained of the rich valley of the Lagan stretching from Moira to Belfast. A bronze statue, by Lynn, of the fourth Marquis, stands in the principal street of the town, and is greatly admired for its lifelike character. built in 1887, are large and well proportioned. There is a school for boys and girls and an infant school, with classrooms for each. In the infant school the kindergarten system is followed. adjoins the Lisburn road at the entrance to the town. It was rebuilt and much improved in 1885. Attached to it are a schoolhouse and teacher's residence. have a meeting house, with burial-ground attached, adjacent to the Park. In the demesne, in a secluded corner, the visitor is suddenly surprised by a small graveyard embowered in fir trees. It is the old burying-place of the Quakers in years gone by. Dedicated to G. G. Tew, Esq., Manager of the Lisburn Branch of the Ulster Bank. According to the best authority to be had on the subject, it appears that at the close of the sixteenth century, and when England's Queen was well stricken in years, the soil of this island was little better cultivated than is the home village of Belfast to the great seaport of Olderfleet (Larne), and for many miles of country on each side, was an almost interminable waste of furze and forest, with here and there a solitary farmstead, rude in construction as the wigwam of an Indian hunter. A few main roads there were, but the general mode of journeying was by bridle-paths, over which norsemen rode and pedestrians travelled, the carriage of merchandise being usually conducted by means of mountain-bred ponies -- a hardy race of animals capable of carrying great weights of goods on their backs at a pace of four or five miles an hour. Outside these pathways there was such a dense growth of elm, oak, and ash that one of the native Chiefs said -- "A man might almost make his way from MacAart's Fort to Lisnagarvey on the tops of trees." About that time a soldier of fortune, Lieutenant-Colonel Moyses Hill, who, unaided by the influence of family power or official patronage, had made his way in the army by the force of his own prowess, was fortunate enough to attract the notice of her Majesty. The Hill family, of which the Lieutenant-Colonel was the sole representative, had at one time owned valuable property in Devonshire. In the reign of Henry the Fourth the Right Honourable John Hill, Judge of the Queen's Bench, possessed a handsome estate in that county, and his mansion at Hill's Court had been famed as a seat of old English hospitality. Sir Robert Hill, a cousin of the Judge, had also been very successful in the legal profession, and sat as Chief of the Common Pleas in the succeeding reign. This learned baronet became heir to the property of his cousin, which afterwards descended to his son John, a private gentleman, who resided at Hill's Court in Devon. It would appear that the next heir, Thomas Hill, Lord Mayor of London in the second year of Richard the Third's reign, had been an extensive merchant in that city. He added much to the family estate, and owned a mansion in Devon called Hillton. This gentleman died at an advanced age, and his successor, Robert Hill, came into possession of a very large property; but, being of a reckless spirit and fond of gaming, he continued with his elder son Edward to dissipate the property, and before the young lad Moyses came of age the entire inheritance had been sold, leaving the junior to push his fortune as best he could. Having early evinced a desire for military pursuits, young Hill entered the army of Queen Elizabeth in 1575, and for several years, was on active service in different parts of the European Continent. In course of his early career he had displayed so much celebrity in the field, and become so popular with his commander, that he was raised to the rank of major, and on his return to England in 1590 he had the honour of being presented to the Sovereign, and obtained the rank of lieutenant-colonel. About that time the state of Ulster was one scene of anarchy. The rebellion of the Chiefs against all forms of British rule had become nearly general, and the head of the O'Neill dynasty, who was twice pardoned on his promise to surrender arms and let his followers betake themselves to rural industry, once again broke faith and took to the field. Lord Essex, Deputy-Governor of Ireland, sent a special messenger to London with despatches containing full reports of the continued tendency to outbreak on the part of the Chiefs. Colonel Arthur Chichester, a distinguished soldier, the descendant of a famous family in Devon; Sir Fulke Conway, of Conway Castle in Wales; and Lieutenant-Colonel Hill were selected, by the Queen to carry on with all possible effect the war against the native princes, under the command of the Earl of Essex. PRONI and The Open University in Ireland (OUI) will be delivering a Local History lecture series, beginning in September 2011. Dr Janice Holmes, Dr Olwen Purdue and Dr Barry Sheehan (OUI) will examine major themes and local history sources, with PRONI staff presenting examples from PRONI's collections. 29th September: What is Irish Local History? Lectures will run from 6.30-8pm at PRONI. Admission FREE but booking essential. Please contact PRONI to secure your place. 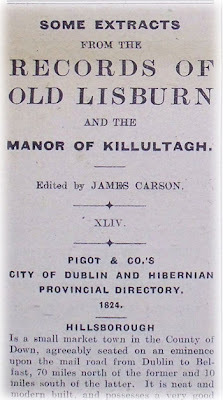 CITY OF DUBLIN AND HIBERNIAN PROVINCIAL DIRECTORY. Is a small market town in the County of Down, agreeably seated on an eminence upon the mail road from Dublin to Belfast, 70 miles north of the former and 10 miles south of the latter. It is neat and modern built, and possesses a very good market, principally for linen yarn. The public buildings here are very handsome, and give an air of respectability not usually possessed by a small town. The church is a very elegant building, consisting of a nave and cross aisles; the tower is 110 feet high, and the steeple 100, forming together a most beautiful piece of workmanship, which may be discerned at a considerable distance; there are also two smaller towers at the sides. The interior corresponds with the exterior, every window being adorned with stained glass; it has a good organ, and a monument by Nollekens to the memory of Archdeacon Leslie is well worthy of attention. The market and courthouse is a large stone building adorned with a clock and vane, and admirably calculated for the purposes of its erection. The other public buildings are the shambles, and two neat schools; but the meeting-houses are situated at some distance from the town. The charitable institutions are a dispensary, open every Wednesday and Saturday, and a school for children of both sexes, conducted on the modern system of education, founded by the Marquis and Marchioness of Downshire, supported by subscription, and attended by about 80 boys and 50 girls; Mr. Francis Ford is the master, and Mrs. Margaret Ford the mistress. There is also an extensive Sunday School patronised by the Marquis and Marchioness. In the adjoining parish of Annahilt is a school founded by Thomas Jameson, a merchant of Belfast, for the benefit of this his native parish; he liberally endowed it with £l,000, which are placed out at interest upon landed property, and the noble Marquis granted four acres of land, upon which the school house stands; 130 boys and 90 girls upon an average attend; Mr. Robert Forsyth is the master, and Mrs. Margaret Forsyth the mistress. Hillsborough contains the noble mansion of the Marquis of Downshire, to whose family this town gives the title of Earl; the Marquis is the proprietor of this place, and also possesses vast estates in the neighbourhood. This town was a borough before the union, and sent two members to the Irish Parliament. Here is a small ancient castle, still kept in repair, of which the Marquis is governor. The quarter sessions are held here; the market day is on Monday, and there are fairs on the third Wednesday in February, and the third Wednesday in May, the third Wednesday in August, and the third Wednesday in August, and the third Wednesday in November. The population is about 1,200. Post master, Mr. Edward Conkey. The mail from Dublin arrives at eight in the morning, and leaves at half-past six in the evening. The mail from Belfast arrives every evening at half-past six, and departs every morning at eight. Downshire, the Most Noble the Marquis of. Forde, Rev. Wm. B., Annahilt Parsonage. Reilly, Wm. Edmund, Esq., agent to the Marquis of Downshire. Rector, the Venerable and very Rev. Robert Alexander, Archdeacon of Down. Curate, the Rev. Mr. Hill. Minister, the Rev. William Wright. Minister, the Rev. Wm. Moorhead. Parish Priest, the Rev. Edward M'Carten. Curate, the Rev. Hugh Dempsey. Corporation Arms (posting inn), Samuel Waring. Bradshaw, H., brewer and malster. Bradshaw, Margaret, grocer, and timber and iron stores. Carleton, S. A., grocer and linen draper. Connor, Foster & Jas., grocers, haberdashers, and earthenware and glass dealers. Druitt, E., grocer and hardwareman. Ellis, Valen., grocer and leather cutter. Jefferson, J., grocer and butter merchant. Trail, F. & M., haberdashers, and straw plait and straw hat makers. BELFAST, the Royal Day Mail every evening at half-past seven, from the Corporation Arms, through Lisburn, and returns-every morning at half-past six. BELFAST, the Royal Night Mail, every morning at eight, from the Corporation Arms, by the same route, and returns every evening at half-past six. BELFAST, the Fair Trader, every evening at seven, from the Downshire Arms, by the same route, and returns every morning at seven. BELFAST, the Shamrock, every Tues., Thurs., and Sat. evening at half-past seven, from the Coach and Horses, same route, and returns Monday, Wed., and Friday, at 40 minutes past five. DUBLIN, the Royal Day Mail, every morning at half-past six, from the Corporation Arms, through Dromore, Banbridge, Loughbrickland, Newry, Dundalk, Castle-Bellingham, and Drogheda, and returns every evening at half-past seven. DUBLIN, the Royal Night Mail, every evening at half-past six, from the Corporation Arms, by the same route, and returns every morning at eight. DUBLIN, the Fair Trader, every morning at seven, from the Corporation Arms, by the same route, and returns every evening at seven. DUBLIN, the Shamrock, every Monday, Wed., and Friday morning, at twenty minutes before six, from the Coach and Horses, and returns every Tuesday, Thursday, and Saturday evening at half-past seven. BELFAST, a Caravan every Wednesday and Saturday, at seven in the morning, takes goods for Lisburn, from the Corporation Arms. BELFAST, a Waggon every Tuesday and Friday, from Mr. Harrison's, and takes goods for Lisburn. DUBLIN, a Caravan goes every Monday, and Thursday afternoon, at half-past four, from the Corporation Arms, and takes goods for Dromore, Banbridge, Loughbrickland, Newry, Dundalk, Castle-Bellingham, and Drogheda. DUBLIN, a Waggon every Monday and Thursday, from Mr. Harrison's, takes goods for the same places. KING WILLIAM III. AT HILLSBOROUGH. On the evening of the 19th of June, 1690, William and the Williamite forces arrived in Hillsborough, nothing remarkable having occurred during the march from Lisburn. The town, which, was then, and still is, the property of the titled family of Downshire, whose name it bears, was incorporated by charter of 14th Charles II., and the Corporation was styled "The Sovereign, Burgesses, and Free Commons of the Borough, and Town of Hillsborough." Its political history is very interesting to the loyal men of Ulster. There the Council of the Antrim Association met at stated times, in 1688, and deliberated in regard to the means to be adopted for the defence of the lives, liberties, and properties of the Protestants of the North. There, also, had been Schomberg and his army, on Tuesday, the 3rd of September, 1689, on their way to Loughbrickland. And a weary way it was; for what the Protestants spared in the flight from their homes the Jacobites destroyed, so that in the district not a sheep nor a cow was to be seen; the track of Schomberg and his men was through ruin. Now the King himself and his forces had arrived. As already stated, the castle had been prepared to receive and accommodate his Majesty. It was a magnificent structure, built by Sir Arthur Hill in 1641-2, and consisted of four bastions. Bonnivert describes it as "a great house belonging to the King, standing on a hill on the left hand of the road;" and in a certain sense the Frenchman was right. The site was chosen so that the fort might command the Pass of Kilwarlin, the chief road between Belfast and Dublin. Accordingly, it was strongly fortified within, and had the additional strength afforded by a trench. At the close of the year 1660 it was made a Royal garrison, and placed in command of a Constable, who received 3s 4d a day, having under him twenty-four warders who pay was each 6d a day. The constableship was vested in the Hill family for ever. As might be expected, the old Castle in the demesne is much venerated by loyal men. There his Majesty remained two days, and strangers are still shown relics of the Royal visit. They have pointed out to them the apartments he occupied; the chair on which he sat; the table on which he wrote his Orders; the window opposite which chair and table stood; the bedstead on which he slept; the stable in which his horse was put up; the situation of the gardens, and the direction in which he walked -- in fact, everything is to be seen but the King himself. More interesting than the silent witnesses is the testimony borne by the successors of the original warders. They are regularly on duty at the new Castle of Hillsborough, wearing the uniform, somewhat modernised, of the Dutch Guards -- blue coat with red lappels; cocked hat trimmed with white lace, and for plume a red feather; white breaches and gaiters. From the Court at Hillsborough his Majesty issued two important documents. One was a Royal Warrant, addressed to Christopher Carleton, collector of customs at Belfast, authorising the payment of £1,200 yearly to the Presbyterian ministers of Ulster. This is understood to be the origin of the grant called "Regium Donum." The pension was inserted in the Civil List and made payable out of the Exchequer. George Story, chaplain to the Earl of Drogheda's Regiment, relates in his "Impartial History" that -- "On Tuesday, 3rd September, 1689, Schomberg's army marching through Hillsborough, a place where the enemy before our coming had kept a garrison, near which, on the highway side, were two of our men hanged for deserting. That night we encamped at Dromore." Some Works Dealing With Hillsborough and Co. Down. The Ancient and Present State of the of County of Down, by Walter Harris. 1744. Topographical and Chorographical Survey of County Down, by Walter Harris. 1740. History of County Down, by Alexander Knox, M.D. 1875. Statistical Survey of the County of Down, by Rev. John Dubourdieu, Rector of Annahilt. 1802. Ireland Exhibited to England (volume 1), by A. Atkinson. 1823. Belfast and Province of Ulster Directory. From 1882. The House of Downshire, by Hugh M'Call. 1881. Reports from Commissioners on Municipal Corporations in Ireland. 1833. From the "Ulster Journal of Archæology," 1901. 1786 -- Six Anthems performed in Hillsborough Church. The music composed by Michael Thomson, Mus.D. "Hillsborough: Printed for the Author, January 2nd, 1786. Pr. 15s." 1790 -- Anthems, &c, as performed in Hillsborough Church. The music composed by Michael Thomson, Mus.D., and others. (Words only.) 32 pages. No place or printer is given. 1790 -- A letter from Lord de Clifford to the Worthy and independent Electors of the Town of Downpatrick, with pertinent Queries to the Electors of the County of Down. (Charles Price.) 24 pages. LINEAGE OF THE DOWNSHIRE FAMILY. Colonel Moyses Hill of Devonshire was founder of the House of Downshire. He entered the army of Queen Elizabeth in 1575. Come, to Ireland about 1590. Received for his services some forty thousand acres of land in Down and two thousand in Antrim. He was knighted, died in 1630, and was succeeded by his eldest son, Peter Hill. Peter's only son, Francis, resided at Hill Hall, and died without male issue. Arthur Hill, younger son of Sir Moyses, then succeeded, and was created constable of Hillsborough Fort in 1660. Moyses Hill, son of Arthur, succeeded his father, and married his cousin, daughter of Francis Hill of Hill Hall, dying without male issue. Next in succession was William Hill, half-brother of Moyses. He married as his second wife Mary, eldest daughter of Sir Marcus Trevor, who was created Viscount Dungannon in 1662 for his signal gallantry in wounding Oliver Cromwell at Marston Moor. William died in 1693, and was succeeded by his eldest son, Michael. He married the daughter and heir of Sir John Trevor of Brynkinalt, Co. Denbigh. Next in succession was Trevor Hill, born 1693, died 1742, first Viscount Hillsborough, created in 1717 Baron Hill of Kilwarlin, and Viscount Hillsborough. Wills, only son of Trevor, born 1718, died 1793, was created Viscount Kilwarlin and Earl of Hillsborough in 1751, enrolled amongst the peers of Great Britain in 1756 as Lord Harwich, Baron of Harwich, in the County of Essex, and advanced to a British viscounty and earldom in 1772 by the titles of Viscount Fairford, County Gloucester, and Earl of Hillsborough. Created Marquess of Downshire 1789. His son Arthur, second Marquess of Downshire, succeeded; bora in 1753, died 1801. Arthur Blundell Sandys Trumbull, third Marquess, born 1788, died 1845. Arthur Wills Blundell Sandys Trumbull Windsor, fourth Marquess, born 1812, died 1868. Arthur Wills Blundell Sandys Roden, fifth Marquess, born 1844, died 1874. Arthur Wills John Wellington Trumbull Blundell, the sixth and present Marquess, was born in 1871. He married in 1893 Katherine (from whom he obtained a divorce in 1902), daughter of Hon. Hugh Hare, Berks; issue, two sons and one daughter. Married secondly (1907) Evelyn Grace Mary, daughter of E. Benson Foster. Clerver Manor, Windsor. To commemorate the public and private virtues of the Most Honourable Arthur Wills Blundell Sandys Turnbull Hill, third Marquis of Downshire, Lieutenant of the County of Down, Colonel of the Royal South Down Regiment of Milita, and Knight of the Most Illustrious Order of St. Patrick. Alike distinguished for patriotism, rectitude of principle and honesty of purpose, upholding his station with becoming dignity. He was also mindful of the wants of others, and practised those duties with benevolence and humility, which won the regard of every generous mind, adding lustre to his exalted rank. Those who best knew his worth and admired the rightness of his character and conduct in the several relations of life have erected this monumental column as a token of their friendship and esteem. 1848. "The Big Marquis of Downshire." Erected by his friends and tenants. Erected in memory of Revd. Galbraith Hamilton Johnston, by the members of the congregation of Hillsborough, who laboured among them for years. "He rests from his labours." Sir Robert Hart, of Chinese fame, was connected with Hillsborough, having lived there during, his early boyhood. According to Juliet Bredon, his biographer, he was born in Dungannon Street, Portadown, in 1885, and when two years of age his parents removed to Hillsborough. REPORTS FROM COMMISSIONERS ON MUNICIPAL CORPORATIONS IN IRELAND, 1833. King Charles II., by charter 1662, granted to Arthur Hill, that the lands in that charter named should be a Manor by the name of the Manor of Hillsborough, and by the same charter ordained that 100 acres of land, in the town and lands of Hillsborough, should be a free borough and corporation, and be called the Borough and Town of Hillsborough, "the said town already built, or to be built, erected, and made in the most convenient place of the said 100 acres." These 100 acres have not been set out, but are supposed to be the 100 acres lying in a circle round the Market House of the borough, as a centre. There is a book in the hands of the Sovereign of Hillsborough containing entries of the proceedings from 1773 to the present year, 1833. The corporate name is "The Sovereign, Burgesses, and Free Commons of the Borough and Town of Hillsborough." The corporation, by the charter, consists of a Sovereign, 12 burgesses and freemen. The "Recorder and Town Clerk" is the only inferior officer appointed. The Sovereign is elected annually on the Monday after the Feast of Saint John the Baptist, and holds for one year, from the Monday after the Feast of Saint Michael next ensuing. The right of election is placed by the charter in the entire body. The Sovereign is to be elected out of the burgesses. The election to the office of burgess is exercised in point of form by the remaining burgesses, but, in truth, all are the nominees of the Marquis of Downshire, the heir of Arthur Hill. The Marquis of Downshire is the "patron" of the corporation, and received the compensation for the disfranchisement of the borough at the period of the Union, amounting to £15,000. The office of burgess is considered of little importance. They are not sworn on admission. The entire number of the burgess is kept up. Only two of tho burgesses are resident. There are not at present any freemen, except Lord Talbot and a few of his friends. No Roman Catholics have been admitted into the corporation; indeed, the notion seems to exist that Roman Catholics are not yet admissible by law into corporations, although the disabilities were removed in 1793. The Sovereign is made coroner within the borough. He also acts as justice of the peace "within the bounds and lymitts of the sayd town and precinctes thereof" during his term of office and for the space of one whole year thereafter. There is no salary or emolument of any kind attached to the office of Sovereign. The Marquis of Downshire gives twenty guineas annually to the Sovereign to entertain the burgesses upon the days of election and swearing-in. Two places called "Black Holes" have been used as temporary places of confinement; a district bridewell is in process of building. There are also notes on privileges and rights of other members of the corporation. Court Leet, Seneschal, Manor Courts, Quarter Sessions, Petty Sessions, Constabulary, the Streets, Schools, Weighmaster and fee, &c., &c.
Fairs to be held in Hillsborough on the first Wednesday of every month, between the 1st March and last of November; and a market every Thursday, with a court of Pie Poudre. Population in 1831 -- 1,453. THE POST CHAISE COMPANION OR TRAVELLERS' DIRECTORY THROUGH IRELAND, 1803. This volume (660 pages) is very meagre and uninteresting in its references to Lisburn and district. It mentions that "Lisburne gives the title of Earl to the noble family of Vaughan." The Vaughans were an ancient Welsh family tracing in direct line back to the year 1200. Viscount Vaughan was created 1776 Earl of Lisburne and Lord Vaughan. 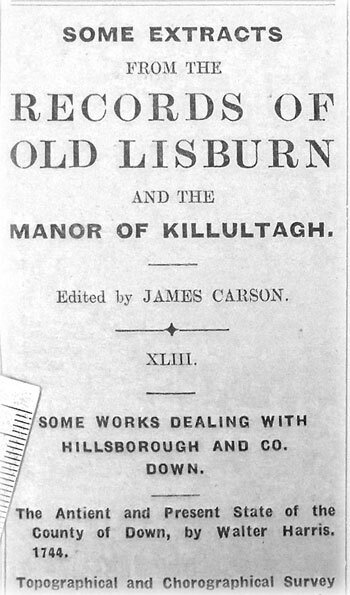 HILLSBOROUGH is pleasantly situated and almost newly built, much in the style of an English town, on a healthy, gravelly soil, in view of Lisburn, Belfast, the bay and town of Carrickfergus, and commanding an extensive prospect of a well-improved country. The Mase course is a mile north of the town, near the banks of the Lagan. A rising hill in the middle of the course, about two miles in circumference, affords a full view of the whole field. The Church of Hillsborough is magnificent, and cost the first Marquis of Downshire near £15,000. The spire is as lofty as that of St. Patrick's, Dublin, and much more elegant; it has also seven painted windows. There is a small castle or fort at Hillsborough, in perfect repair, in which were deposited the arms of the county. A very thriving manufacture of muslins has been introduced into this town under the patronage of the first Marquis of Downshire. The present Marquis has a fine demesne and neat villa here. BBCs Who Do You Think You Are? 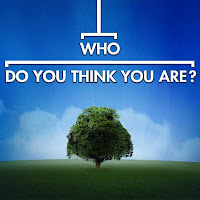 in which celebrities trace their family trees to reveal the lives of their ancestors returns on Wednesday, 10th August at 9.00pm for a new series. ... begins her investigation in London, by exploring her great great great grandfather's involvement in the shadowy underworld of 19th century bare-knuckle boxing. Tracing her ancestors further back, the trail leads June to Holland and the story of a family tragically divided by war. Pushing back even further, June discovers an extraordinary document that reveals the impact the Spanish Inquisition had on her family, causing them to be forcibly expelled from North Africa. Hearth-money Rolls for Lisbourne Parish and Towne, 1669. Hearth-money, hearth tax, or chimney-money was a tax imposed on all houses except cottages at a rate of two shillings for every hearth. It was first levied in 1602, but owing to its unpopularity, chiefly caused by the domiciliary visits of the collectors, it was repealed in 1689. The principle of the tax was not new in the history of taxation, for in Anglo-Saxon times the King derived a part of his revenue from a "fumage" or tax of smoke farthings levied on all hearths except those of the poor. It appears also in the hearth-penny; or tax of a penny on every hearth, which as early as the 10th century was paid annually to the Pope, and became popularly known as "Peter's pence." An Act of Parliament, Charles II., 1662 -- Imposes a tax of 2s each on every hearth and other place used for firing and stoves within every dwelling and other house and edifice that are or hereafter shall be erected within this Kingdom of Ireland other than such as are in this Act hereinafter excepted. Persons living on alms exempted, and all houses certified by two justices to be not of greater value than 8s upon the full improved rent, and that the persons occupying the same do not have, use, or occupy any lands, or tenements of the value of 8s per acre, or have any lands, tenements, goods, or chattels of the value of £4 in their own possession, or held in trust for them. Houses having no fixed hearth, with chimneys, chargeable with two hearths. The original lists or rolls for County Antrim are in the Record Office, Dublin. A copy is in the possession of the Presbyterian Historical Society, Belfast. 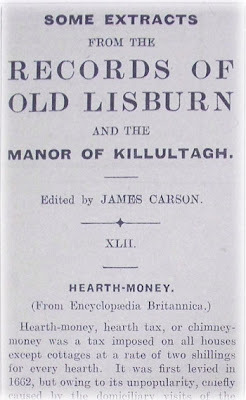 From this copy J. W. Kernohan, M.A., extracted the names relating to Lisburn Parish and Town, as here given. Where a number follows a name it indicates the number of hearths, stoves, ovens, &c., taxed. In all other cases there was one hearth only. These rolls are obviously an index to the social status of the inhabitants of the period, the number of hearths taxed indicating the social position or wealth of the individual, Sir George Rawdon heading the list with 39. It is rather curious that Sir George Rawdon's name appears as occupying the Castle, Lisburn, and not the name of Baron Conway, as there can be no other means of accounting for the 39 hearths than locating them in Baron Conway's Castle, in the Castle Gardens. Sir George Rawdon was the ancestor of the Earls of Moira. He married in 1654 as his second wife Dorothy Conway, sister of the second Viscount Conway. We find Rawdon in 1654 building a house in Lisburn, and this is possibly the house that appears against his name for 3 hearths. He died in 1634, and was buried in Lisburn. The third Viscount Conway succeeded to the estate in 1665, and died in 1683. He built the Castle at Portmore, on the shores of Lough Neagh, in 1664. It was pulled down in 1761. This was his favourite residence, and was much more splendid and extensive than the Castle at Lisburn. His Lordship spared neither time nor expense in adorning and beautifying it, and the grounds were stocked with ail kinds of rare animals, birds, trees, and shrubs. Sir George Rawdon may therefore have been temporarily in occupation of Lisburn Castle in 1669, thus accounting for his name appearing in the Hearth-money rolls for that year. Indeed, it would appear that after Portmore Castle was built the Lisburn Castle was neglected, and rarely, if at all, occupied by Viscount Conway. We find from "Bonnivert's Journey, 1690," that in that year Lady Mulgrave was in occupation. 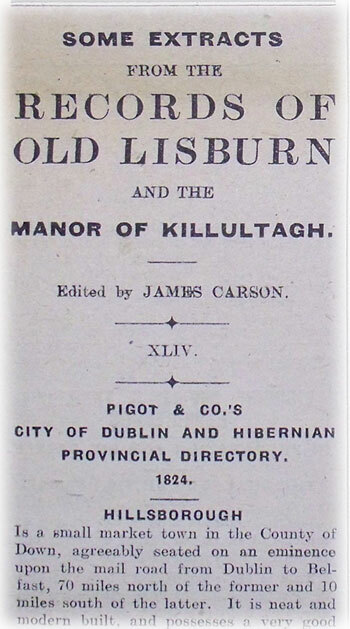 "There is a great house and good gardens at Lisburn belonging now to my Lady Mulgrave. The house is out of repair." "Bonnivert's Journey," is given in the Ulster Journal of Archæology, vol. 4, 1856. He was a French refugee who followed the fortunes of William III. 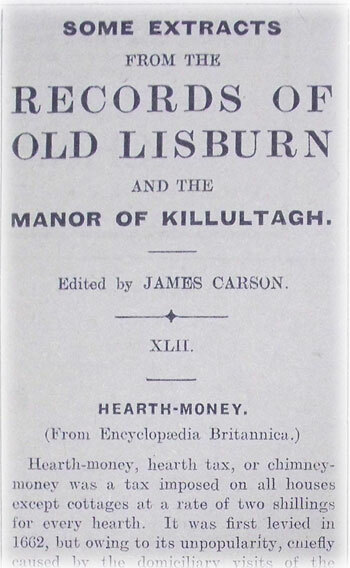 It is noticeable, and rather unusual, compared with other districts, the large number of names appearing in the Parish of Lisburn as paying tax on more than one hearth. 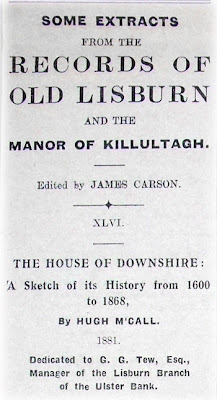 The inference, of course, is that in 1669 the town of Lisburn, although small, must have had within its bounds a number of people of comparative wealth, and in the immediate neighbourhood, comprising the parish, there must have been, a considerable population in comfortable circumstances. Story, a chaplain in Duke Schomberg's army, writes of it twenty years later, in 1689:-- "One of the prettiest inland towns in the North of Ireland, and one of the most English-like places in the Kingdom." Unfortunately, the names in the Hearth-money rolls for 1669 are given as a whole fOR "Lisbourne Parish and Towne," no differentiation being made as between the town and country, nor are the names of the townlands included in the parish stated. 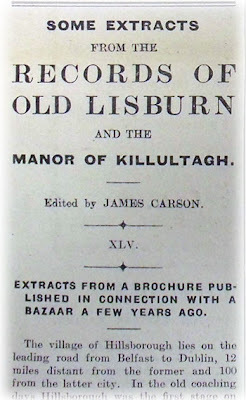 The parishes of Lisnagarvagh and Blaris were united about the year 1641, the combined parishes forming what is now known as the Parish of Lisburn. This amalgamation causes some uncertainty as to what townlands were included in the 1669 rolls, as up to the present time frequently the two parishes are treated as if they were still distinct. 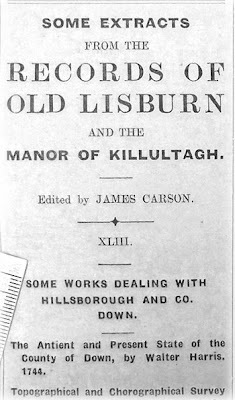 Referring to a return published by the "Standard" Office, Lisburn, some years ago, of the electoral divisions of the Lisburn Union, it would appear that Lisnagarvey, Old Warren, Tonagh, Knockmore, and part of Lambeg South are described as being in the Parish of Blaris or Lisburn; Ballymullen, Largymore, Broughmore, Gortnacor, Lurganure, Lissue, Blaris, Ballantine, Deneight, Lisnatrunk, Lisnoe, Taghnabrick, Annacloy, Aghnatrisk, Ballykeel-Ednagonnell, Culcavey, Carnbane, Carnreagh, Drumatihugh, Maze, Magherageery, and Ravarnette, or portions of them, in the Parish of Blaris; Magheralave in the Parish of Derriaghy. On a map of the Hertford Estate dated 1833 the Parish of Lisburn is described as containing the townlands of Broughmore, Lurganure, Lissue, Knockmore, Tonagh, Old Warren, Blaris, Ballentine, Taghnabrick, Largymore, Ballymullen, and Lisnagarvagh, all being included in the Hertford property and in the vicinity of the town. It is a fairly reasonable assumption that these, are the townlands included in the Hearth-money rolls for the Parish and Town of Lisburn for 1669.